How many oz to this glass? What is the thinnes of glass? BEST ANSWER: Thank you for your inquiry. The PolyCarb Pinot glass holds 22 oz. The glasses are 1/16" thick. If you have any further questions, please reach out to us at 800 356 8466. Thank you again. Thought all red wine could be served in same kind of glass - what's the differnce between the pinot and merlot glasses? BEST ANSWER: Thank you for your inquiry. Shape is the key. As different profiles react to different locations of your tongue, shape matters. As a universal glass, I'd say the merlot glass is the way to go, but, being varietal specific, the pinot glass with the tapered bowl hits the back of the tongue better. If you have any further questions, please reach out to us at 800 356 8466. Thank you again. I can't get over how much I love these glasses! I was a little worried after reading some of the reviews, but I'm really glad I went ahead and ordered them anyway. Even my husband was surprised when he picked up the glass and realized it wasn't "glass". I would definitely recommend these glasses if you are looking for something non-breakable or to use outside. • Looks like the real thing! It looks good, but it is scary to drink out of due to the rough edge on top; the opening is almost too small to get my hand in to wash and I have small hands. I use it outside and on my proch that has a ceramic tile floor. These wine "glasses" are very light and have a sharp edge around the inside of the lip of the glass. Not satisfactory at all. I Love them. They look so real. Even my guests were shocked when they picked them up. love them. They look good and don't break when dropped on the patio or on concrete floors--and they do well in the dishwasher. What more can you ask for in a plastic glass. I love my new outdoor wine glasses. I have Riedels in my cabinet. One evening I had washed one of my outdoor glasses and the next morning went to put it in my cabinet thinking it was one of my glass wine glasses. I would recommend these glasses. These glasses are light, pretty, and just right for us to use in our outdoor hot tub. I cannot tell you how much money I have spent over the years on wine glasses. This is absolutely perfect for our lifestyle and as attractive as glass. Thank you! I've been looking for wine glasses for our pool area. I was hesitant using traditional glasses. But the plastic outdoor wine glasses were not cutting it. These wine glasses are the closest to the real thing out there. Worth the [$] investment per glass. Safe, durable and looks the part. I was looking for an unbreakable wine glass to use by the pool and this was a perfect buy. My friends thought it was glass. This is attractive and not your ordinary thick, plastic glass that most stores carry. I don't know how they hold up in the dishwasher, as I wash these glasses by hand. My only con is the rim is slightly sharp/rough and when washing the glass,you may give yourself a paper cut. I would recommend these glasses and am contemplating getting more! Great for wine tasting parties and not worrying about breaking my expensive Reidels. My son just bought a home with a pool and I purchased these to use mostly outdoor. He was very impressed with their quality and appearance. Haven't been used yet so can't verify dishwasher use. We gave these to our son and daughter-in-law for Christmas. We have some and they asked for them also. 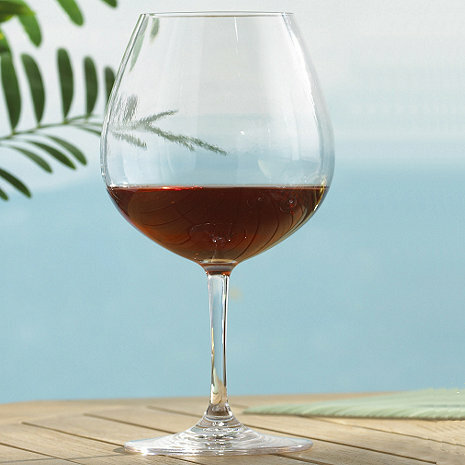 We like them because they're thin and it seems like we're drinking out of "regular" wine glasses - - not the thick, bulky ones you usually find for patio/pool use. You won't be disappointed with your purchase. they need to be a bit heavier so they feel like real glasses...but not thicker. hve no idea if his is possable. These glasses are better than glass for use by the pool. After reading other reviews, I thought these would feel more like the glass ones; but the do not. They are extremely lightweight. They almost (but not quite) feel like the throw away plastic party glasses. I haven't found anything better; but would like to find unbreakable wine glasses that feel more like real glass. THESE GLASSES WORK WELL IN OUTDOOR AREAS SUCH AS DECKS AND PATIOS WHERE THERE IS A POTENTIAL OF UNINTENDED WINE SPILLAGE THAT CAN INVOLVE KIDS, DOGS AND OR ADULTS. I have a high end dish washer. Crystal and glass come out sparkeling. These "glasses" come out with spots all over. I hate hand washing anything. If you don't want to hand wash these, don't buy them. Lives up to the non-breakable hype, but the rim opening of the polycarbonate glass is much too narrow for a pinot noir, as is suggested by the manufacturer. I wanted this for wweekend trips and vacation, also for outside use. But the feel of the edges are to sharp to drink out of. They need to round the edges more to make this work. I BOUGHT THESE SIGHT UNSEEN AND THOUGHT THEY WOULD BE OF EQUAL QUALITY TO SOME OTHER GLASSES I HAD PURCHASED FROM ANOTHER FIRM, STRONG STURDY HARD TO DISTINGUISH FROM GLASS BUT UNFORTUNATELY THESE ARE MADE OF THIN PLASTIC, YOU CAN SEE A SEAM AND THEY DO NOT HAVE THE HEFT OF THE OTHERS. I AM VERY DISSAPPOINTED BY THE LACK OF QUALITY. disappointed that the glasses have no "heft" like a real wine glass.